Countywide, The Botanist has now raised a staggering £43,500 in total for Barnardo’s, with a large number of staff additionally volunteering and taking on challenges such as skydiving and the National Three Peaks Challenge. With 1500 hours of team time pledged altogether, almost 30 employees have also signed up to Barnardo’s mentoring schemes. Predominantly aimed at young care leavers, these support young adults who are often forced to become independent much younger than other children. Volunteer mentors facilitate their transition to adulthood, providing both emotional and practical support. Other efforts by the restaurant’s ‘Believe with the Botanist’ campaign saw them host a Christmas party at The Oast House in Spinningfields – also part of the New World Trading Company – for South Manchester families supported by Barnardo’s-run children’s centres. Around 120 children and family members attended to see Santa, tuck into a festive buffet and enjoy live music and face painting. Barnardo’s, which celebrated its 150th anniversary last year, uses 91p of every pound donated towards their services; which include support for care leavers, disabled children, vulnerable families and children who have been sexually exploited or abused. 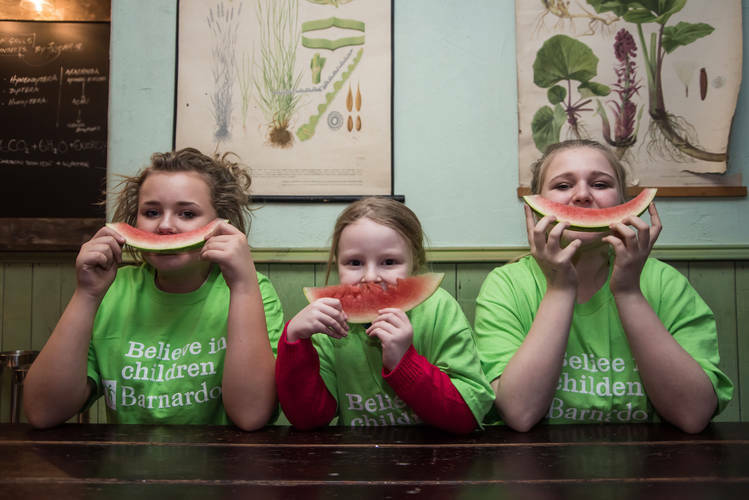 Jane Harries, Regional Fundraising Manager for Barnardo’s said: “We have been blown away by the enthusiasm and generosity portrayed by the teams at The Botanist. Not only have staff members gone above and beyond in work and by individually completing challenge events to raise money for Barnardo’s, but they have also put on amazing events for our young people, some of whom will never forget the special occasions they were treated to.